The road to central London is a notoriously dangerous route for the city’s many cycling commuters. But now, the first two of 12 proposed bicycle “superhighways” have opened, in a city-sponsored effort to encourage bicycle commuting as a way of reducing traffic and pollution in the city. 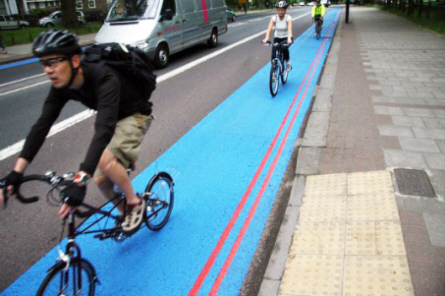 The lanes are part of London Mayor Boris Johnson’s ambitious, “cycle revolution” campaign, which coincides with preparations for the 2012 Olympics. Johnson has stated that his program will change the London experience for the better and serve as a model for other cities. The first two routes cover about 8.5 miles each, linking south and east London—where there are already many bicycle commuters—to the city center. “spokes” leading to central London. ing the road becomes a norm, rather than a competitive sport. To get all of the details, you can watch the Official promotional video here. 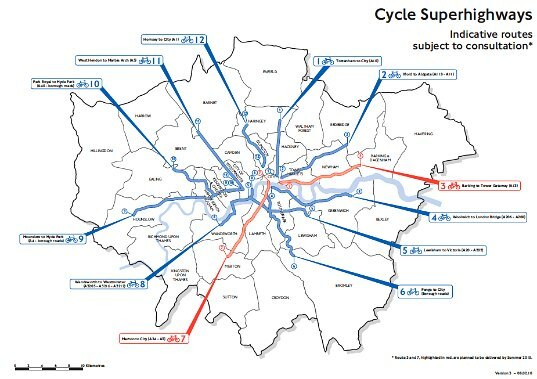 Further criticism comes from London cyclists, who say the new routes may be an improvement, but by no means live up to the name “superhighways.” And London’s Green Party says the administration is underspending on its cycling budget. Will the new bike lanes achieve their goals? The two-wheeled jury will decide the ultimate verdict.